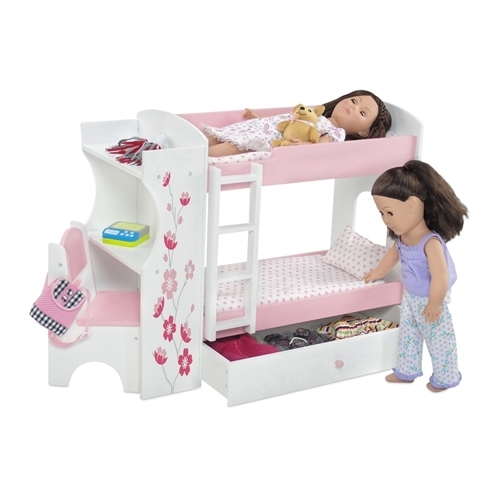 This amazing bunk bed combo piece is perfectly sized for your 18" doll's bedroom! Painted pink and white with a gorgeous, multi shade pink floral print, this bunk bed set comes with a built-in ladder, and each bunk includes a pretty pink polka dot blanket and pillow, plus a thick white mattress for a comfortable nights sleep! Under the lower bunk is a great drawer for storing doll clothes and doll accessories which can also double as a trundle bed during sleep over parties!! What make this piece ultra functional is the built in, perfectly sized desk and chair combo, with shelving to store extra doll stuff!! 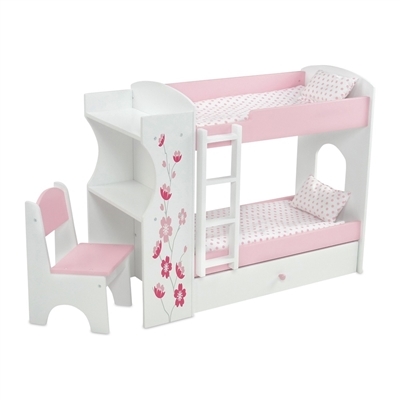 This sturdy and versatile pink and white wood doll bunk bed includes ladder, built-in desk with chair, and storage drawer for doll clothes and accessories. Features a lovely floral design and comes with 2 sets of lovely pink polka dot bedding, including comforter, mattress and pillow. Assembled furniture piece measures 26.25" x 11.75" x 21". Dolls, doll clothing and accessories are not included.